It shouldn't happen- but it does! "Fiendly Fire" it is called- being bombed or shelled by our own troops. While serving with the 15th Field Regiment artillery,in Germany, it happened- we dropped some rounds among our own infantry, to their great consternation, and our remorse. Later we found that the ammunition had been produced in different factories, in several countries, supposedly to the same military standard. But it WASN'T!- hence the difficulties! In action, being field artillery, we didn't take on airplanes, except, once, in Germany, near Oldenburg. At the guns, we were surprised to hear "target airplanes" from the forward observer. And he had us blaze away ot the unusual targets, although it was a unequal contest! Later we found that these enemy planes were unable to take to the air, as they had no fuel, so were spotted facing our approach, with the pilot manning the guns, ordered to halt our advance, with no hope of survival. 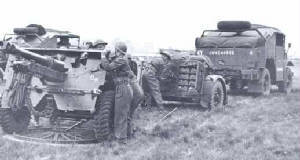 In the 4th Armoured Division, in Germany, we had the 1st Canadian Rocket Battery, in support, with 34 projectors, firing rockets singly or in bursts. They had big trucks pulling the projectors and hauling several tons of rockets. Often they set up near our gun positions, fire a barrage, which shook the ground, then depart, leaving us to receive the return fire! 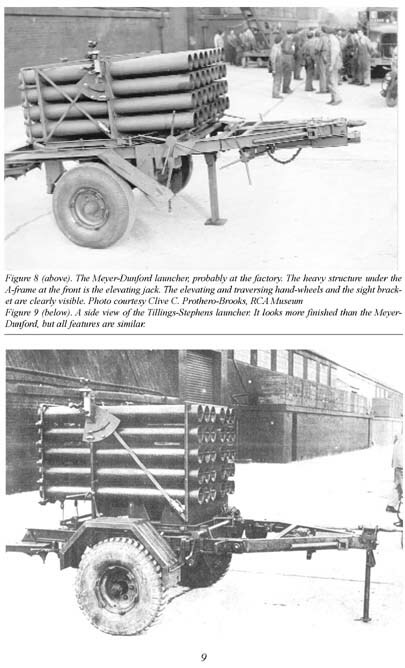 The rocket projector- coded- LAND MATTRESS as used in the Canadian Fourth Armoured Division. This is one of our 25-pounder guns in action (the shell weighs 25 pounds) and it is sent on its way by propellent bags of cordite, either 1, 2 or 3 bags- each a different color (red, white and blue, of course!) depending on the range to the target. They should be to the same standard, but in wartime it came from different factories, and often from different countries. They werent always to a standard! In action, the guns may fire hundreds of rounds, so additional ammunition is brought up, for their use, often from "mixed" lots- adding to the chance for errors. While in action, in Germany, I almost became a midwife! We were in farming country, near Oldenburg, the telephones were out, and a woman was in labour. The husband came to our command post, asking for "an officer." It appears that he thought "officers can do anything." Everyone looked expectantly at me, to my dismay. Fortunatly, our cook was also a farmer, who had attended many barnyard births, so he volunteered. And it turned out to be twins!